A reported leak of President Rouhani’s proposed government budget last month has triggered a wave of nationwide unrest in Iran which erupted on December 28. The budget leak exposed parts that were generally kept secret, and Iranians discovered that billions of USD were going to the military, hardline organizations, the Islamic Revolutionary Guard Corps (IRGC), and religious foundations. At the same time, the budget proposed an end to millions in subsidized and an increase in fuel prices. Following the leaked budget, Iranians vented their frustration against the money going to the military and clerical establishment via a popular messaging app in Iran used by an estimated half of the country’s 80 million inhabitants. On December 28, 2017, the hardliners, led by the prominent Ahmad Alamolhoda, started a demonstration in Mashhad, where hundreds shouted slogans against the weak economy and shouted “Death to the Dictator,” and “Death to Rouhani.” Videos of the event spread and triggered protests nationwide in the days that followed, despite attempts by authorities to block access to popular social media and messaging services used to organize and publicize the protests. At the time of writing, the unrest has reportedly led to at least 450 arrests and 21 deaths. 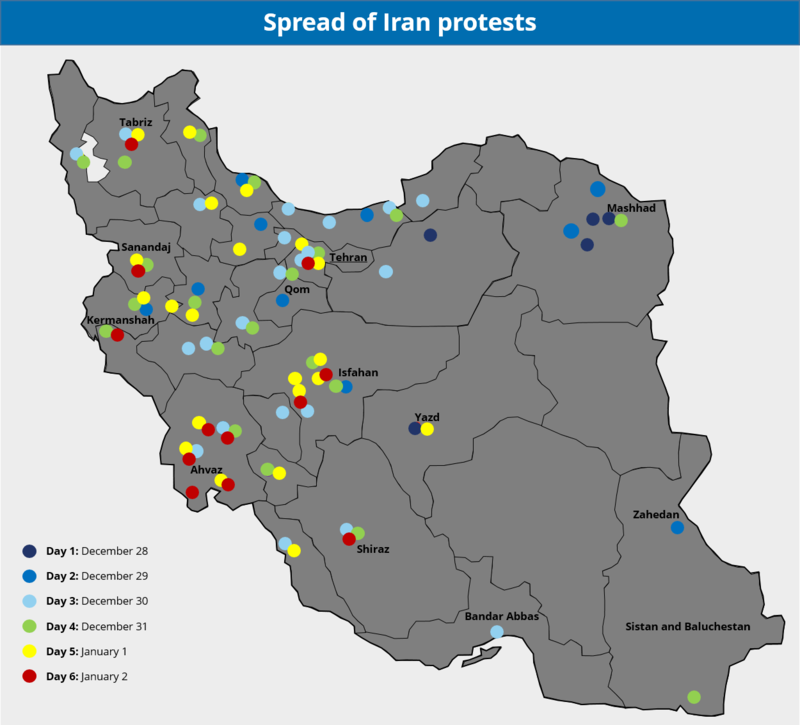 The unrest recorded over the past week comes amidst small-scale protests witnessed across Iran over the past months surrounding topics of economy and employment. These include demonstrations of hundreds of oil workers and truck drivers protesting late payment of wages, workers at a large sugar cane plantation and mill complex, bus drivers, teachers, tractor workers in Tabriz against their factory’s closure, Tehran tyre workers at bonuses being delayed, and victims of failed financial institutions across the country. In this context, the leaked budget served as a catalyst for these latest protests, and underscores the frustration and anger among large segments of the population over social-economic problems among the disaffected young people in peripheral, rural areas who have largely driven the demonstrations, in stark contrast to the protests witnessed in 2009 during the so-called “Green Revolution”, which were largely led by the urban middle class. While the unrest began over economic grievances, it has since taken on a political dimension as demonstrators have voiced anger over corruption and the perceived authoritarian political system as a whole. This is reflected particularly in the anger over Iran’s regional policies and how it spends billions of USD to extend its influence abroad, including in Iraq, Syria, and Lebanon, despite the high unemployment and economic woes at home, as highlighted by the slogans of “Let go of Syria, think about us” and “I give my life for Iran, not Gaza, not Lebanon”. Moreover, what makes these protests exceptionally notable is the extent of the radical and sometimes slogans used, as some have called for the death of the president and even unprecedented calls of “Death to Khamenei” and calling for the Supreme Leader to step down and demanding the exit of clerics from politics. FORECAST: We assess that it’s unlikely that the protest movement will survive in the long-term and lead to a collapse of the system for several reasons. First, the fact that it has taken on a political dimension and the use of political slogans has been exploited by the authorities as a justification to crack down on protesters as “anti-social” and violent elements. Moreover, this government approach has been aided by the support protesters have received from abroad, particularly from the US, Israel, and Saudi Arabia. The Iranian authorities already perceive, or at the very least vocalize the perception that the unrest has been manufactured and manipulated by foreign governments. That these foreign governments are openly and publicly supporting the protests will thus only further serve to strengthen this perception and allow the government to increase its crackdowns under the guise of protecting Iran’s sovereignty from the interference of foreign states. With this in mind, should the Iranian authorities decide to implement their forces fully, including the IRGC and the Basij, in repressing the protests, it’s highly likely the demonstrations will be swiftly minimized. Second, unlike the “Green Revolution” in 2009, these latest protests lack leadership, alternative, and a shared vision. Protesters are united in what they don’t want, rather than what they want, as indicated by the often contradictory slogans. Some want democracy, yet more nostalgic ones praise the former monarchy and the Shah. 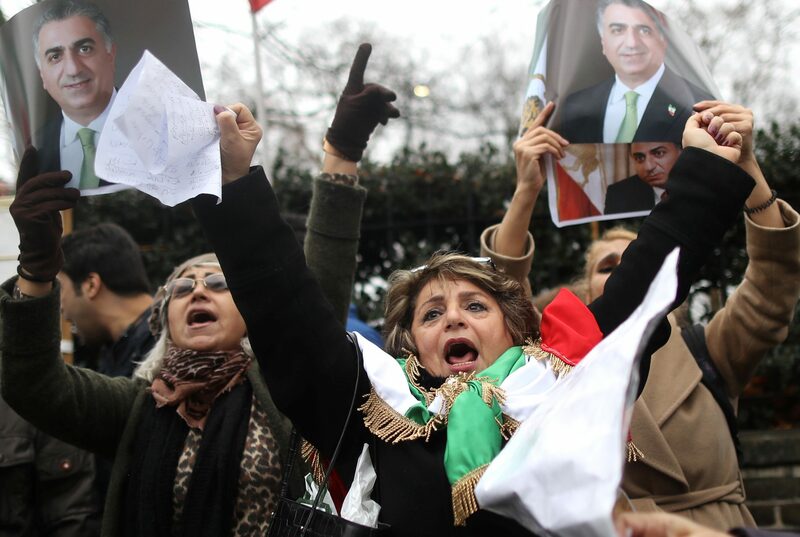 Demonstrators have called for the death of moderate Rouhani, yet also called for an end to the clerical establishment. Others still are invoking nationalistic ideals and racial slogans, such as “We are Aryans, we don’t worship Arabs.” Overall, given this lack of leadership and organization, the protests are likely to either peter out over time, particularly if the government shows a willingness to make concessions and reforms or will be quelled by an increased crackdown. That said, we assess that the heightened unrest will continue for longer in the country’s peripheral regions where both civil unrest and militancy stemming from sectarian tensions have long been an issue. These include the southeastern Sistan-Baluchistan Province, a predominantly Arab-populated southwestern Iran, including primarily Khuzestan Province, and the majority-Kurdish-populated northwestern Iranian provinces of Kordestan, West Azerbaijan, Kermanshah, and Ilam. Over the past week, we have already witnessed a higher level of unrest and arrests in these areas, as local activists and militant groups are likely seeking to exploit the nationwide discontent to further their own separatist ambitions. Furthermore, the authorities have a history of severely cracking down on these regions, thus making it more likely for escalations between security forces and locals. 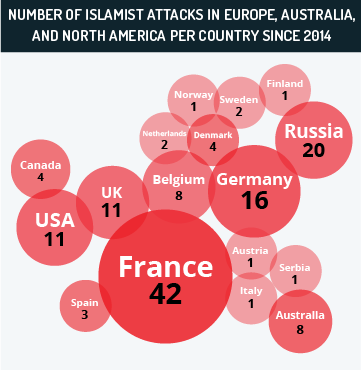 Over the coming weeks and months, such escalation will likely lock these regions in a vicious cycle of arrests, which subsequently provoke the locals to further unrest and militant attacks, prompting a security crackdown in return. Business travel to Tehran, Esfahan and other major cities may continue at this time while remaining cognizant of ongoing protests and avoiding the vicinity of such events. Western nationals are advised to remain cognizant to prevailing negative sentiment toward the United States and other North American and Western European countries. 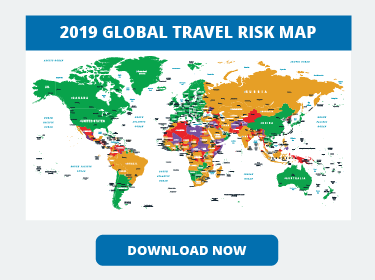 We advise against all travel to outlying border areas with Pakistan, Turkmenistan, Iraq, Azerbaijan, and Armenia due to ongoing militant activity. 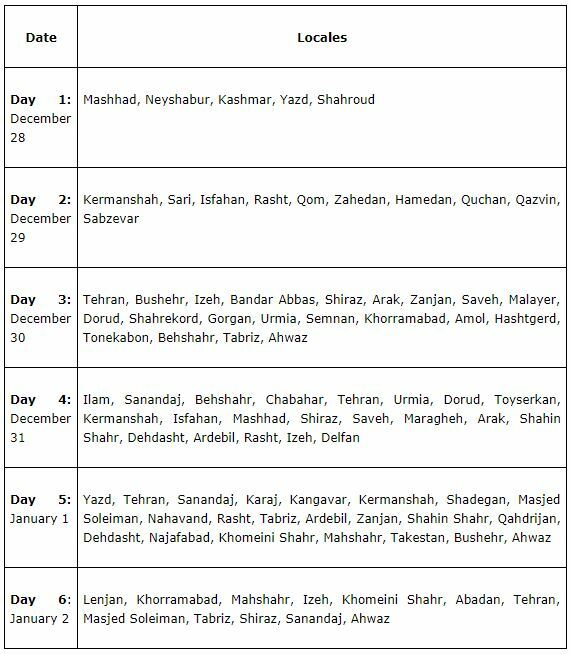 Those traveling to Iran should anticipate prolonged questioning by customs officials. Refrain from traveling with sophisticated cameras or other features affiliated with journalists. Cooperate with all security officials and respond to questioning in a respectable and calm manner. Refrain from discussing the current political situation, Iran’s nuclear program, or tensions with the United States and Israel with local residents as a basic precaution. Be advised that authorities may monitor communications from hotels and other facilities frequented by foreigners, while internet access may be limited. In the event that embassy services are required, it is advised to check the operational status of pertinent embassies and consulates. Consular services for US citizens are provided through the auspices of the Swiss Embassy in Tehran. Hey Buddy!, I found this information for you: "Widespread unrest reflects discontent with Rouhani’s economic policies, money spent in regional conflict; protests likely to subside – Iran Analysis". 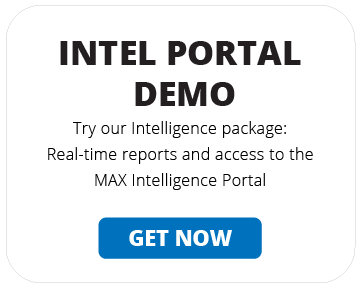 Here is the website link: https://www.max-security.com/reports/iran-protest-analysis/. Thank you.